Have you seen Sir Chief already in person? If not then try to eat at his latest restaurant along Tomas Morato called Luna J. Upon arrival at the area, you would see this big very inviting signage. Spoliarium painter and national hero Juan Luna is the inspiration behind Luna J Filipino Gastropub's name. Luna J Filipino Gastropub is not about complex presentations or trendy food but simple, made-from-scratch preparations of Filipino dishes scoured from all over the archipelago. It is located at Il Terrazzo building in Quezon City, just a few steps away from Wang Fu Chinese Bistro owned and operated by Richard Yap, a.k.a. Sir Chief of "Be careful with my heart" fame, together with his business partners/ friends Ace Wang and Lester Pimentel Ong ( who happened to be my cousin). Our family is very proud of Lester because he is not only a Wushu World Champion and movie and TV fight director but he is also a very kind person, doting father, loyal husband and a very good businessman, all rolled into one. It can seat down comfortably 24 persons inside its air-conditioned dining area. They have both indoor and outdoor dining areas. Ambiance is great! I highly recommend the adobong manok of Luna J. The chicken meat is so tender, sweet and very tasty. I simply love it. Superrr sarapp! 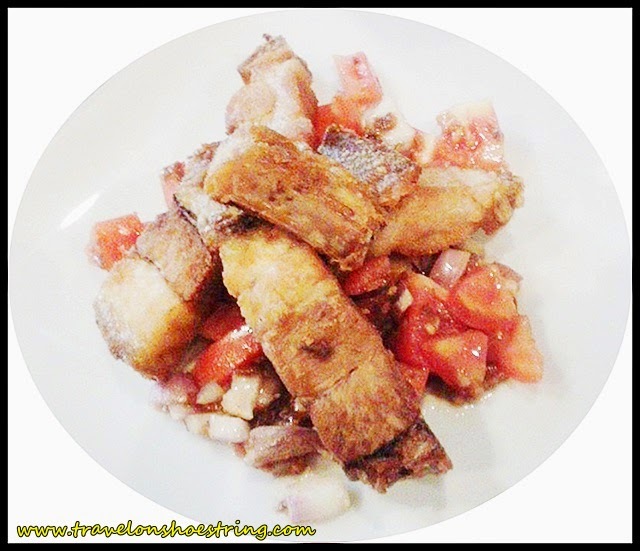 Bagnet with KBL - ( Kamatis, Bagoong, Lasona or in English Tomatoes, Fish Sauce & Onion Relish) is another of its bestseller. I think this dish is from Ilocos. Because when I went to Ilocos several years ago, the family of my friend's husband made sure we had this Ilocano meal everyday that I became addicted to it. 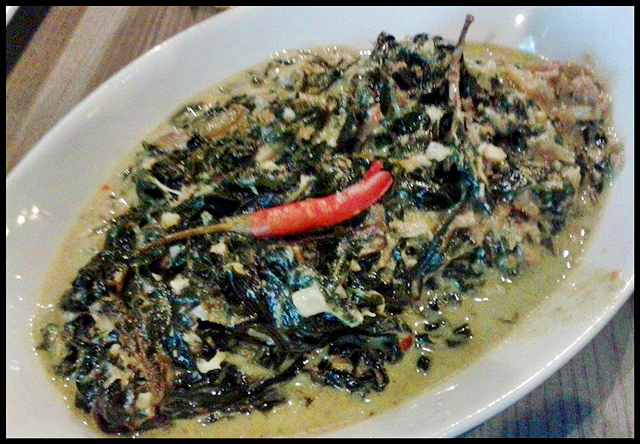 Seeing and eating this dish at Luna J has brought back so much memories of my summer vacation in Ilocos. Eating it immediately sent me to pork heaven. Ha ha ha! Kalderetang Baka is one of the classic Filipino dishes served by many household during special occasions like birthdays and fiesta. Luna J's version is more like that of a beef mechado because it has a lot of tomato sauce. Bakareta or Kalderetang Baka in Bicol is spicier. But it tastes just as great and the meat is just as tender. A must try! Gising Gising is refreshingly delicious. This dish is unknown to me until Freda Co recommended this dish to us. 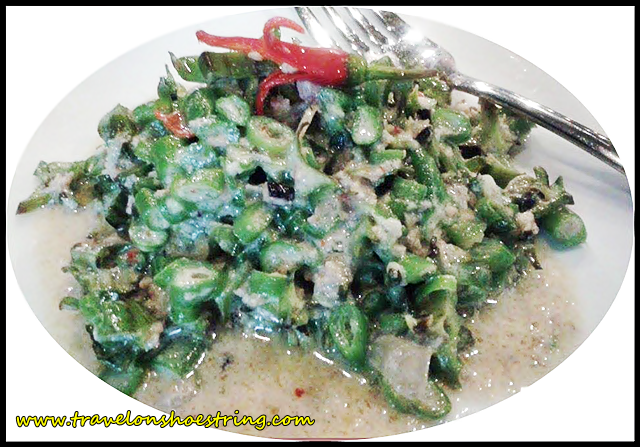 Gising Gising, it turned out, is a traditional Filipino dish blending minced meat with sigarilyas (winged beans), chilis and coconut sauce. I think this dish is a distant cousin of laing. Ha ha ha! 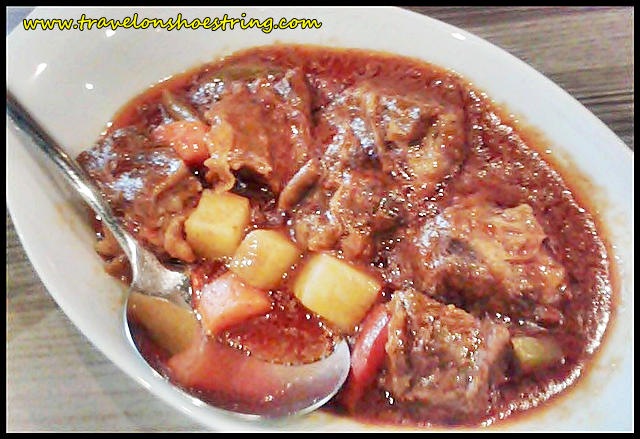 It hit the high notes with the chili and from the sweet and fresh taste of its gata (coconut milk). Oh, how I love its sweet and spicy taste! Laing. I am from Bicol and I could attest that Luna J's version is excellent. The "gata" used is kakang gata. It is sweet, fresh and very delicious. The laing has a rich savory flavor and a tingle of chile warmth on the finish. It's really a must try. 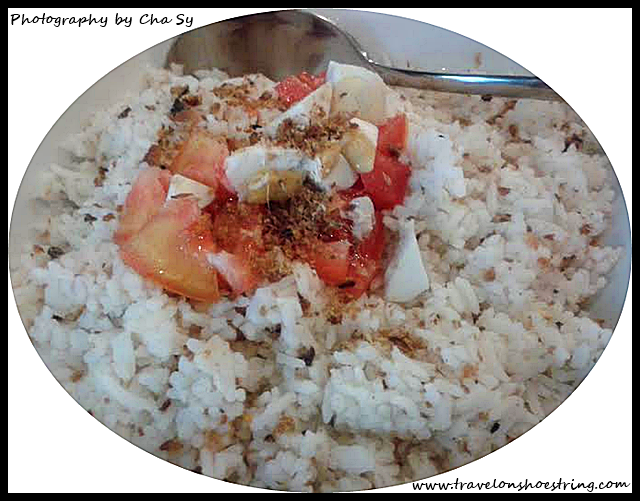 Tinapa Rice is a yummy Filipino fried rice dish made up of tinapa (smoked fish) flakes, cooked rice and seasoning topped with tomato and salted eggs. 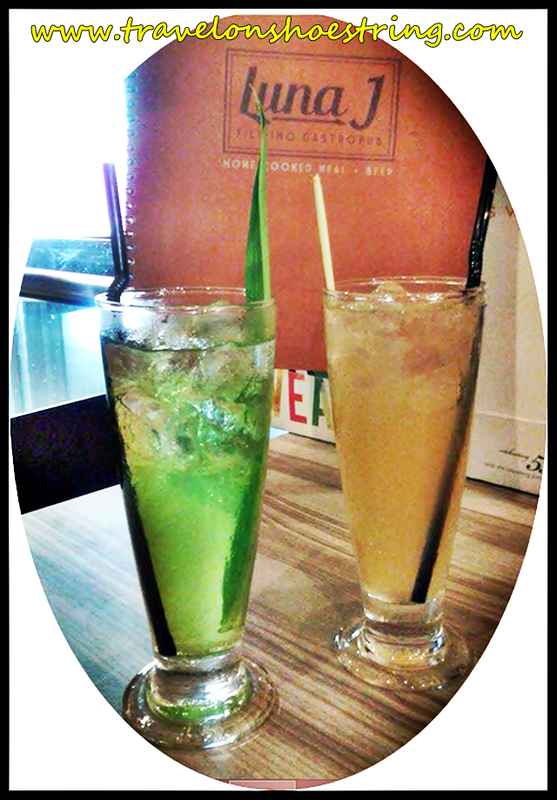 Luna J's thirst quenchers Pandan juice and lemongrass juice. Lemongrass is named as such but has no connection with lemons except that it has a strong lemon-like aroma and taste. I am telling you do not let this humble grass deceive you. It is packed with so much goodness that it can help improve so many chronic conditions. Nutrition-wise, it is a good source of vitamins A and C, folate, magnesium, zinc, copper, iron, potassium, phosphorus, calcium and manganese plus it has minute traces of the B vitamins. The health benefits of lemongrass is tremendous due to its superior anti-microbial, anti-oxidant, anti-inflammatory, and anti-cancer properties. For dessert, you could not go wrong with the traditional Filipino dessert palitaw (Sticky rice dumplings with coconut and toasted sesame seeds). In Filipino, litaw (lee-tou) means to rise. To emerge. To appear. To be seen again. 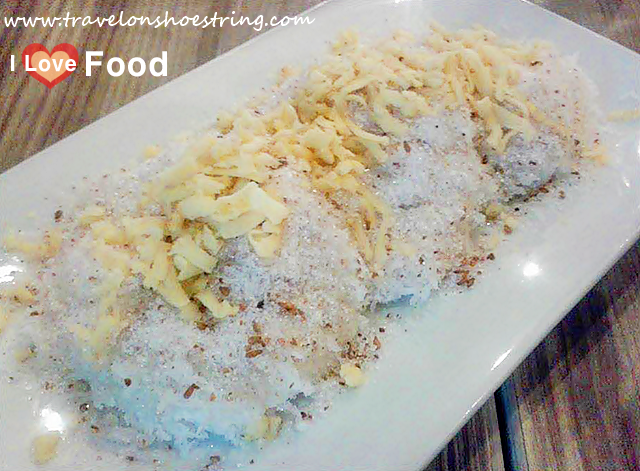 Palitaw (pah-lee-tou) is a sweet rice dumpling sprinkled with a generous amount of grated coconut, sugar sesame seeds and cheese. The cheese added a new twist. Intrigued, I picked up one piece of palitaw with my fork and took a bite. I was immediately transported to dessert heaven because of its soft, chewy dumplings that has a delightful texture of coconut and the rich nutty flavor of toasted sesame seeds with a cheesy twist. I licked my fingers clean of the sugary grit and reached out for another. Truly one-of-a-kind. Truly tastes like home. 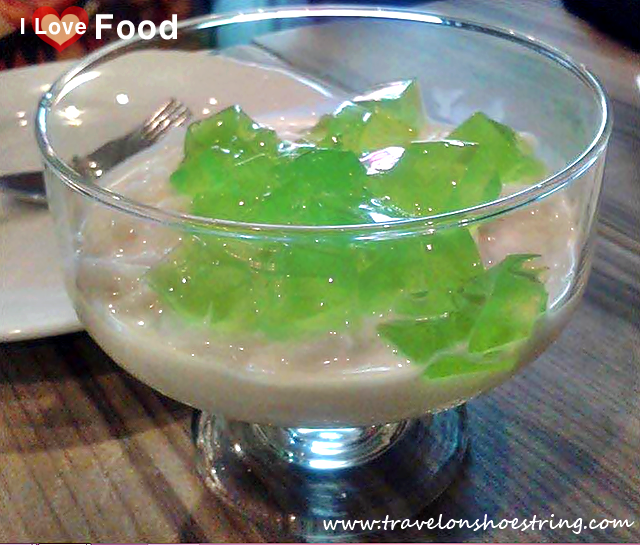 Buko pandan was invented by Aling Amor, a good friend and ex-officemate of my good friend Eva. I know how to make this dessert since I was young because Eva thought me how to do it long before it became a household name. And Luna J's version did not disappoint. Luna J's staff are friendly and service is good and fast. I believe that's the normal day-to-day dining scenarios at Luna J. We were really stuffed when we finished our meal. Luna J Filipino Gastropub is now included in my all-time favorite restaurant. You might want to visit them for a good bonding with your friends and family. 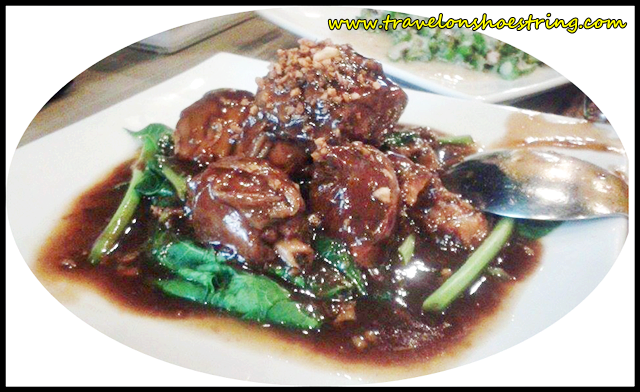 Its entrees ranges from over PHp 65 to PHp 325 on the average, the prices are so affordable. Its food portions are generous. If you’re into drinking alcohol, its menu is perfectly set up as pulutan (appetizer taken with alcohol). Luna J also serves zero degrees beer for only Php50. Wow, great selections of Filipino Food. Ma bisita nga to eat and try out their dishes. Thanks for this great discovery Ms. Cha. Thanks for dropping by at my blog Kuya Teddy Claudio. You should bring your whole family at Luna J kasi talagang mag e enjoy po kayong lahat at mamumutawi ang katagang- "Masarap" sa inyong mga labi! Hi, Louisa! You're welcome. Yes, give it a try and enjoy its various Filipino dishes with your family. Looking at your pictures made me hungry.